Apple's new iPhone 3G S hasn't hit store shelves yet but already there's talk of next year's models, which are expected to leverage ARM's multi-core processor designs in giving the touchscreen handset a significant performance boost while simultaneously increasing battery life once again. Like Palm's new Pre device, the iPhone 3G S is believed to be powered by a single-core ARM Cortex-A8 running at roughly 600MHz. It may be the last of its breed, however. 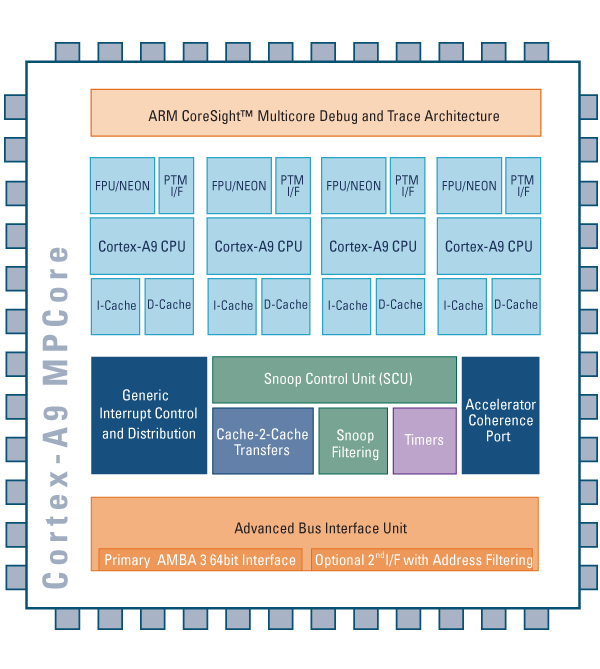 Future embedded processors from the world's leading mobile chip designer are expected to follow a path similar to those for conventional PCs, by which performance gains are achieved by scaling up the number of available processor cores. Reference designs for ARM's next-generation Cortex-A9 call for versions with either two or four cores, with dual-core versions "definitely" slated to turn up in smartphones that will ship sometime in 2010, James Bruce, wireless segment manager for ARM, told CNet News.com in a phone interview earlier this week. "What we've done on the A9 is actually make it more power efficient than the A8," he said. "The dual-core A9 will be coming out on 45-nanometer rather than the (current) 65-nanometer process." The smaller, more precise design of the A9 will signal a faster, more power-efficient chip. And although power consumption will increase some 10 to 20 percent at peak performance when compared to the A8, Bruce noted that smartphones based off the new design will actually see better battery life in real-world usage situations. That's because, like the A8 in the iPhone 3G S, the A9 will process instructions in larger batches more efficiently than its predecessor, which means that computations will happen more rapidly and processes will take less time, leaving the battery in future iPhones with more juice for browsing the web, sending email, and uploading video files. The A9 also sports some out-of-order processing characteristics, letting the chip make use of processor cycles that would otherwise be wasted by current chip designs. "You're getting a 2X increase (over the previous ARM design)," Brunce said of the A8 in the upcoming iPhone 3G S. "And actually the A9 takes that even further. It's a superscalar design but it's also an out-of-order design as well. There is some out-of-order aspects with the A8 but the A9 is a very aggressive out-of-order processor." In addition to these enhancements, Apple is expected to build some of its own proprietary technologies into future iPhone chips based off ARM's A9 reference designs with the help of resources acquired last year in the purchase of fabless chip designer P.A. Semi. Last July, it secured "a long-term architecture license to ARM's current and future technology" that will allow it to do so. By returning to its roots and developing its own brand of ARM chips in-house, Apple stands to keep a tighter lid on its future product plans while possibly saving on costs at the same time. It will also allow the electronics maker to innovate in a way going forward that will differentiate its handheld products from a growing array of competitive devices that will be left to rely on ARM's broadly available reference designs.